Referee Stuart Richardson apologised for giving an opportunistic Fara Williams goal from the halfway line as Liverpool beat Birmingham City 2-1. Williams scored a spectacular lob from the re-start after Birmingham had equalised through Hannah Keryakoplis. The Birmingham players protested saying the referee had not blown his whistle but he gave the goal. The win puts the defending champions to within a point of Women's Super League leaders Chelsea. City head coach David Parker confirmed Richardson had apologised after the game. Referee Richardson apologised to the Birmingham management and players after his error led to Liverpool's 89th-minute winner. But that was no consolation to Blues, whose defeat saw Liverpool leapfrog them into second place. The late drama was never signalled during a game in which the Reds had most of the possession, and in which the home side created several chances. 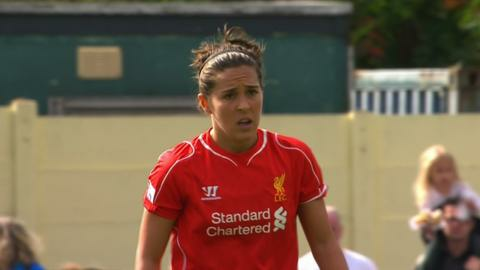 Striker Kirsty Linnett twice narrowly missed the target before Liverpool had threatened the Blues goal. The visitors went ahead in the 29th minute when striker Amanda Da Costa smashed in a close-range shot into the roof of the net from a Martha Harris pass. Midfielder Katrin Omarsdottir went close to doubling the lead with a 55th minute 20-yard drive that flew just over the bar. Birmingham then edged the remainder of the second half and levelled the scores in the 88th minute. Goalkeeper Libby Stout scuffed an intended clearance straight to former Liverpool player Keryakoplis, who lofted the ball home from 40 yards. Blues were still celebrating when Williams, spotting keeper Becky Spencer back-pedalling towards her penalty area, made the decisive strike. With Chelsea, Liverpool and Birmingham having just two games each remaining, the three-horse race for the title is set to go to the wire. Everton look doomed to the drop after defeat left them trailing second bottom Notts County by seven points, with just three games left. The writing was on the wall against City when midfielder Jill Scott put the visitors in front from striker Krystle Johnston's sixth-minute cross. Toffees captain Michelle Hinnigan twice went close to equalising in a spirited fightback. But they went further behind when central defender Lindsay Johnson deflected a 56th minute Isobel Christiansen shot into the net for an own goal. And the points were wrapped up for City in the last minute when striker Toni Duggan fired home from a Natasha Flint cross.